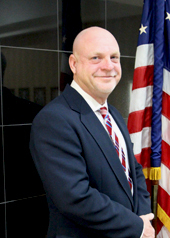 Greg Mashburn was appointed by the City Council to Place 1 in August of 2018. Mr. Mashburn grew up in a military family. He was a graduate of Fyffe High School where he was salutatorian of his graduating class of 1990. He attended Snead State and graduated with his associates degree in science. He also attended Auburn University. Mr. Mashburn raised cattle for 22 years. He has been employed at Farmers Telecommunications Co-op for 23 years. He began his career as a lineman and is now a supervisor of outside plant engineering. Mr. Mashburn is married to Denise Drain Mashburn of Scottsboro. They have one child Ayden 10 yrs old of Scottsboro. They are all members of Scottsboro First Baptist where Mr. Mashburn serves as deacon and also serves on the personnel committee for the church. Mr. Mashburn is committed to supporting infastructure for the growth of our great city thru industrial development. He believes in accountability and transparency at all levels of government. Mr. Mashburn always strives to make himself available and to listen to what concerns citizens have. He is committed to promoting growth and prosperity for all the citizens of Scottsboro.